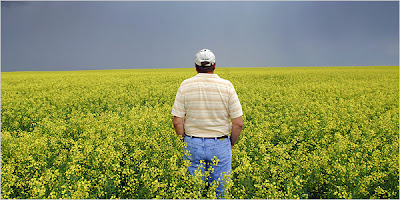 David Monson, looking at his canola field in photo by Dan Koeck, is "at the leading edge of a national movement to legalize growing hemp, a plant that shares a species name, a genus type and, in many circles, a reputation, with marijuana," Monica Davey reports for The New York Times from Osnabrock, N.D.
Monson "listens to Rush Limbaugh in his tractor . . . is the high school principal in nearby Edinburg, population 252 . . . [and] is a Republican representative in Bismarck, the state capital, where his party dominates both houses of the legislature and the governor is a Republican," Davey writes, with just a hint of wonder. The legislature "has passed a bill allowing farmers to grow industrial hemp and created an official licensing process to fingerprint such farmers and a global positioning system to track their fields," she reports. "This year, Mr. Monson and another North Dakota farmer, with the support of the state’s agriculture commissioner, applied to the Drug Enforcement Administration for permission to plant fields of hemp immediately." But the DEA has not acted, and "hemp is considered the same as marijuana," Steve Robertson, a DEA agent at the agency's Washington headquarters, told the Times. Monson and another farmer have filed suit against the drug agency. Robertson told the Davey that the DEA was still reviewing their applications, but "he could not say much beyond that because of the litigation," she writes. Hemp contains tetrahydrocannabinol, the substance that produces a marijuana high, but its advocates "note that it contains mere traces of THC, and that hemp (grown in other countries) is already found here in clothes, lotions, snack bars, car door panels, insulation and more," Davey writes. "Maine, Montana, West Virginia and other states have passed bills allowing farmers to grow industrial hemp, Alexis Baden-Mayer of Vote Hemp, a group that lobbies for legalization of it as a regulated crop and is helping with the lawsuit, told Davey. After asking why three executives of Purdue Pharma shouldn't go to jail for their marketing of the painkiller OxyContin, which became the scourge of the Appalachians, U.S. District Judge James Jones accepted a plea agreement that requires the company to pay $600 million in fines. "While this may not be a popular decision, my job is not to make popular decisions but to follow the law," Jones said in court at Abingdon, Va.
"Jones said it would be improper to send someone to jail for something they didn't actually do," reports Laurence Hammack of The Roanoke Times. The executives "were held criminally accountable for misbranding committed by other company officials. In order to obtain convictions, prosecutors did not have to prove they even knew that crimes were being committed under their watch. Not only were the convictions based solely on the executives' positions of responsibility, there was also no evidence to link the misbranding to rampant abuse of OxyContin." The executives will pay $34.5 million in fines. There were several winners with rural connections at last night's Sigma Delta Chi awards banquet at the National Press Club in Washington, but none so rural as Mike Lester of the Rome News-Tribune in Georgia, circulation 18,500, who won the for editorial cartooning in 2006. Few papers with circulation under 20,000 have editorial cartoonists, a point noted by the judges, who said, "We applaud the Rome News-Tribune, a small newspaper, for having a full-time editorial cartoonist on staff." Publisher Burgett Mooney III said in an interview that he wanted a cartoonist because he sees a "provocative" editorial page as a way to build and maintain circulation. "It gives us a place to really drive people to the newspaper," he said. Lester has been cartooning for the paper for five years. He was living in Rome and doing cartoons for an online news service until the dot-com bubble burst, then Mooney recruited him. Lester tackles local, state, national and international topics, but said in an interview that he tries to make two of five cartoons a week have some local connection, often through a setting that is not identified but that local will recognize as a locale in the town of 35,000. Lester is generally conservative, but has an independent streak. The newspaper "tends to be what is considered conservative on economic matters and liberal on social issues," said the editorial-page editor, Pierre-Rene Noth. The News-Tribune is part of News Publishing Co., which also publishes seven weeklies in northwest Georgia and Cherokee County, Alabama. The Sigma Delta Chi Awards were established in 1932 by the organization now known as the Society of Professional Journalists. The current program began in 1939, when Sigma Delta Chi presented its first Distinguished Service Awards. When Sigma Delta Chi changed its name to SPJ in the 1980s, the original name was retained for the awards and SPJ's foundation. Its board includes Al Cross, director of the Institute for Rural Journalism and Community Issues. Several awards were handed out last night for coverage of rural issues by urban media. Marx Arax of the Los Angeles Times won in the magazine-writing category for a series of stories on a California raisin picker. Todd Melby and Duane Richard of Chicago Public Radio won in radio documentary for "Flatlined: How Illinois Shortchanges Rural Students." Two awards were given for coverage of the Sago Mine disaster: to NBC Nightly News, for breaking news coverage on TV, and Mine Safety and Health News, for public service in newsletter journalism. For a complete list of this year's and past winners, click here. At last week's U.S. Mine Safety and Health Administration hearing on proposed new regulations for seals in coal mines, miner Charles Scott Howard played a video that showed seals cracked and leaking water in Cumberland River Coal Co.'s Band Mill No. 2 Mine in Letcher County, Kentucky. "Market conditions, rising fuel prices, additional taxes, postal rate increases and advertiser pressures have combined to affect newspaper distribution costs and have forced the Savannah Morning News, like many other newspapers, to reconsider its delivery processes," Morning News reporter Christian Livermore writes. He quotes Publisher Julian Miller: "Right now, we're delivering out about 120 miles - places where we have just a few subscribers and single-copy customers. With the cost of gasoline, labor, paper, trucking, everything has combined to make it impossible to recoup your investment that far out." Jodi Deal of The Coalfield Progress in Norton, Va., said "Edwards didn’t make a speech when he visited the Wise County fairgrounds Wednesday. He didn’t outline the changes he’ll make if he’s elected as the country’s leader. Nor did the former North Carolina senator take questions from the dozens of local, regional and national press representatives who covered the event. Instead, on the last day of a three-day tour aimed at highlighting the plight of poverty-stricken Americans, he listened. At an hour-long roundtable discussion conducted outside at three picnic tables, Edwards asked organizers of the annual Remote Area Medical outreach, which provides free health services, to tell him stories about healthcare problems in Southwest Virginia. He asked for it, and he got it, and so did the crowd of about 200 spectators who turned out to see a presidential candidate." (Read more) Deal also has a good "behind the scenes" story. Edwards is scheduling at least one more stop in rural Kentucky. The Mississippi River town of Columbus, population 229, won an online competition for an Edwards town-hall event, beating out "cities such as Dallas and Los Angeles," thanks to Columbus native and University of Kentucky graduate Shawn Dixon, Herald-Leader Political Writer Ryan Alessi reports on the paper's PolWatchers blog. 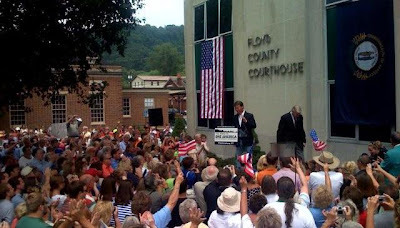 Edwards concludes his anti-poverty tour where Robert F. Kennedy did, in Prestonsburg, Ky.
Democratic presidential candidate John Edwards concluded his three-day poverty tour this afternoon at the old Floyd County Courthouse in Prestonsburg, Ky., where Robert F. Kennedy concluded a similar tour as he prepared to run for president in 1968. "This country needs a movement to restore our values. We need a movement that actually embraces work again, not just wealth," he said, according to The Courier-Journal's Stephenie Steitzer. Samira Jafari of The Associated Press bureau in Pikeville wrote: "Edwards said he wasn't trying to mimic his 'political hero.' 'I don't deserve to be compared to Bobby Kennedy,' Edwards told the crowd that spilled across the courthouse lawn. He added, 'I want America to remember what he did decades ago. I want you to join us to end the work Bobby Kennedy started.'" AP put Democratic candidate Barack Obama in the same story, saying he "made his own speech for the nation's poor on Wednesday, speaking at a recreation center in the nation's capital, and in a jab at his rival, argued that combating poverty was hardly new for him, a one-time community organizer in Chicago. Edwards, coming off criticism for getting $400 haircuts and building a new 28,000-square-foot mansion, repeatedly tapped into his own humble roots in an effort to connect with the coalfields." Jafari reported that Edwards "heard firsthand accounts of the problems plaguing the region" and "was especially moved" by Wise, Va., coal miner James Lowe, 51, "whose cleft palate kept him from talking for five decades until a dentist last year volunteered to perform a $3,000 orthodontic procedure for free. Edwards shared the story ... at his other stops, saying Lowe and other low-income workers 'deserve better.'" In Whitesburg, Ky., Edwards said the only solution to such problems is universal health care, and said that Lowe, "instead of being angry at living 50 years with such a condition in the world's richest nation, "was thankful and appreciative" for his treatment. "When are we going to start treating people like him … with the dignity and respect that they’re entitled to?" he asked. When Tennessee legislators saw that Gov. Phil Bredesen had budgeted money to run a water line "up a mountain in Warren County for residents who don't have water, tempers flared as legislators demanded to know why one county got money when others needed it, too," Sheila Wissner reports in The Tennessean of Nashville. Rep. Mike McDonald of Sumner County, just north of Nashville, "gathered more than three dozen signatures on a bill that would have authorized the Tennessee Department of Environment and Conservation to develop a statewide water plan and loan fund to help communities extend more water lines. It would have been patterned after the Kentucky Infrastructure Authority, which requires all projects using state or federal funds to be vetted through an organized chain of local and regional councils. The bill didn't pass this session, but McDonald says he'll push the issue again next year." he told Wissner, "We need a statewide comprehensive plan to get water to people, and then we wouldn't have these arguments." A study the department did for McDonald in 2004 "estimated that 5 percent of Tennessee households didn't have municipal water. It would take 18,470 miles of lines to get water to 112,000 households, at a cost of $1.7 billion, the study estimated," Wissner writes. "The study did not delve into the number of households with no clean, reliable alternative water source. That number remains unknown. The problem is most evident in Middle and East Tennessee, where well drillers fight the rocky terrain" and drill dry 10-20 percent of the time. Sometimes, existing wells go dry. That happened to Tammy and Wayne Blatt, who live on a farm near Carthage in Smith County. In photo above, by Shelley Mays of The Tennessean, Tammy Blatt washes dishes outside near the drums of water her family must buy and haul twice a week, at considerable expense. Massachusetts, often on the cutting edge of many things, has left much of its rural population far behind in access to broadband, or high-speed Internet service. "State officials have yet to develop a comprehensive policy for fixing the telecom time warp. But this fall, three Western Massachusetts towns will participate in an experiment to test wireless networks in rural settings," reports Carolyn Y. Johnson of The Boston Globe. "We are creating a new kind of ghetto," said Don Dubendorf , president of Berkshire Connect Inc., which works to bring broadband to businesses and institutions in the Berkshires of western Massachusetts. "It's morally wrong. It's stupid economically, it's dangerous from a public safety point of view, it's absurd from a public education point of view." This fall, Dubendorf's company and Pioneer Valley Connect "will create WiFi hot spots in the towns of Florida, New Salem, and Worthington, with funding from the quasi-public John Adams Innovation Institute," Johnson writes. "The idea is to use radio transmitters to spread the signal from high-speed lines to create square-mile wireless broadband networks for homes, businesses, and municipal buildings, without the massive investment needed to wire every home." 68 percent of all households with annual incomes over $50,000 now get broadband vs. 59 percent last year; 39% of all households with annual incomes under $50,000 get broadband vs. 27% last year. While 81 percent of all US households have at least one computer, only 56 percent of those with annual household incomes under $30,000 have a computer at home. Just 45 percent of households with annual incomes below $30,000 subscribe to an Internet service at home, compared to 92 percent of households with annual incomes above $75,000. Overall, only 7 percent of all Internet subscribers say that broadband is not available in their area. Deep in the Central Appalachian coalfield this morning, presidential candidate John Edwards said the U.S. should put a limit on its emissions of carbon and reduce the limit each year so that emissions of carbon dioxide, the main gas that causes global warming, are reduced 80 percent by 2050. A carbon limit is anathema to the coal industry, the region's major employer, but the industry's safety and environmental records make it controversial, and Edwards' remarks won applause from the crowd at Appalshop, the media and arts center in Whitesburg, Ky., and its Appalachian Media Institute for young people. Edwards' comments came in response to a question from Nathan Hall, a Berea College student from Floyd County, who said he plans to return to the area to start a bio-fuel company. Edwards said the government should require permits for carbon emissions and auction them to “the polluters pay. … That money should be used to fuel your biofuel work” and other alternative fuels. “I’m glad you’re doing work on biofuels,” he told Hall. “That is the answer, ultimately.” Biofuels are big in Iowa, the first presidential voting state. Edwards said a biofuel industry “can create at least a million new jobs” and the government can “direct the jobs to the places where they’re most needed,” with grants to train at least 150,000 a year, he said. “This is a great economic opportunity, and an opportunity that I think could have a real impact on this area,” he said. That would appear to require the commercial scale-up of technology to create ethanol from cellulose; Appalachia is heavily forested and raises little biofuel feedstocks such as corn and soybeans. The Federal Communications Commission is about to enact new regulations allowing customers of rural wireless companies "to roam in more cities and at lower rates," reports Paul Davidson of USA Today. "Rural carriers complain that the large national carriers often charge them exorbitant roaming fees and sometimes refuse to let them roam on their networks," Davidson reports. "The strategy has squeezed many rural providers out of the market, says the Rural Telecommunications Group," a lobby for small carriers. The National Newspaper Association has announced the top placers in the general-excellence competition of its annual Better Newspaper Contest. The general-excellence awards are based on placement in detailed contest categories, which include both news and advertising. NNA has about 2,500 members. More than 85 percent are weekly papers, but its contest also has categories for dailies. The first-, second- and third-place winners will be announced at the NNA Convention and Trade Show in Norfolk Sept. 25-30. Among dailies with circulation of 16,000 and larger, the top three papers in the contest (in no particular order here or in any category) were the Antelope Valley Press of Palmdale, Calif., and two from Colorado: the Greeley Tribune and the Daily Times-Call of Longmont. Under 16,000, the top three were the Lebanon (Mo.) Daily Record, The Journal Review of Crawfordsville, Ind., and The Daily Record of Baltimore. NNA listed six winners among non-dailies with circulation over 10,000, indicating that the judges gave three honorable mentions in the category as well as first, second and third places. The six are The Taos (N.M.) News; The Ellsworth (Me.) American; the San Francisco Bay Guardian; the Idaho Mountain Express of Sun Valley; The Independent Weekly of Lafayette, La. ; and The Peninsula Gateway of Gig Harbor, Wash. We're most familiar with the Ellsworth paper, which acts like a daily; it covers the state capital and regularly does project reporting, currently on Maine's program to give all students laptop computers. Among non-dailies with circulations of 6,000 to 9,999, two of the three winners are from favorite spots for recreation and second homes: The Eastern Edition of the Southampton Press, which serves the Hamptons area at the end of New York's Long Island; and the Jackson Hole News & Guide of Jackson, Wyo. The other winner was a perennial, the N'West Iowa Review of Sheldon, Ia. The paper carves its own niche in many ways. It is a regional weekly that is famous for publishing scores of special sections each year, it doesn't put content online, it doesn't spell out "Northwest" in its name, and would like us to put "Review" in all capital letters, but we don't approve of such typographical tyranny. However, we do approve of the job that Peter Wagner, his sons and staff do with the Review and their local weekly, the Sheldon Mail-Sun. The winners among non-dailies 3,000 to 5,999 include some well-known, quality papers: The Hutchinson (Minn.) Leader, the Litchfield (Minn.) Independent Review and the Hood River (Ore.) News. Under 3,000, the winners are the Curry County Reporter of Gold Beach, Ore.; The Community News of Aledo, Tex., just west of Fort Worth; and the Mount Desert Islander of Bar Harbor, Maine, a paper that has the same ownership as The Ellsworth American. They make quite a pair Down East. "People will tell you government doesn't work. But I've seen it work. It starts with somebody showing up and making an effort. I have also seen it fail. Mostly that happens when no one's paying attention." (Read more) Davis, a filmmaker by trade, is president of the Center for Rural Strategies in Whitesburg and a member of the advisory board of the Institute for Rural Journalism and Community Issues. Perry Bacon Jr. of The Washington Post reports on the tour's first day: "The 37 million Americans in families that make less than $20,000 a year, the federal definition of poverty, are not the kind of group that can push Edwards to victory. Poor people vote at lower percentages than their wealthier counterparts, by definition don't have much money to give to candidates and aren't an organized political constituency like the elderly." “It’s a measure of how desperate some of us were that we suppressed private doubts and wrote glowing accounts of his tour. 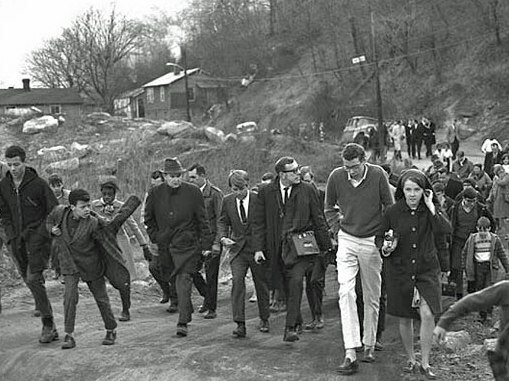 Over the ensuing decades that tour has acquired the aura of something more spiritual than political, and it’s not surprising to see John Edwards striding along the pilgrim’s path, hoping that some fragment of the enshrined Kennedy mystique will adhere to his campaign. But skepticism and cynicism, although arguably unavoidable, aren’t very useful. There would seem to be intriguing parallels between 1968 and 2007, especially in the apparent fact that the candidates’ great wealth and good fortune failed to blind them to the needs of those less lucky or gifted. And the fact that both were more wedded to well-meaning rhetoric than to far-ranging policy proposals shouldn’t be held against them, not at this point at any rate. No one, least of all Roosevelt, knew what he would do for the downtrodden until he was actually in the White House. No one, early in 1968, knew what Robert Kennedy would do: It was too soon to know, and then it was too late. 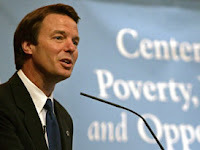 No one, in mid-2007, knows what John Edwards would do or whether, if elected, he would actually have the leverage to enact the initiatives, far-reaching or otherwise, that he might deem essential to redirect and revitalize the mostly afflicted and largely outsourced economy of Appalachia. So, rather than being a time to render some sort of judgment, it seems to be a time to watch and listen … maybe even to hope.” For Bethell's entire article, click here. Today, a voter in New Orleans asked Edwards on ABC's "Good Morning America" how he could justify a $400 haircut. “I don't,” he replied with a smile. He said that in a busy campaign, such things are arranged by others, and “I should have been paying closer attention and it shouldn’t have happened.” When host Diane Sawyer broadened the inquiry, implicitly questioning the sincerity of Edwards' anti-poverty campaign, he replied, “A completely fair question … If you look at the arc of my life, I came from having very little to having a lot. … I want that chance to be there for everybody.” He said he was involved in urban ministries in North Carolina, helped organize union workers, pushed for raising the minimum wage (which he said could be the single most important solution to eliminating poverty), and started a program for poor kids in eastern North Carolina that gives them their first year of college free if they work. To watch, click here. “Here’s a surprise,” writes Geri Nikolai of the Rockford Register Star in Northern Illinois. “Children growing up in rural areas are more likely to be overweight or obese than their city counterparts. That’s the conclusion drawn by researchers at the University of Illinois College of Medicine at Rockford after reviewing Centers for Disease Control and Prevention data on 46,000 children. "A controversial war rages abroad, having claimed the lives of thousands of American troops. In the White House, an increasingly unpopular president limps to the end of his term. And out in some of America's poorest precincts, a telegenic candidate who hopes to replace him calls on the nation to put an end to poverty. Bobby Kennedy in 1968? Yes, and consciously echoing him this week, John Edwards in 2007," writs Richard Allen Greene of Politico.com, the new, well-staffed, Washington-based Web site for political news. Al Cross, the veteran Kentucky political writer who now heads the Institute for Rural Journalism and Community Issues at the University of Kentucky, said there could be political capital in the poverty tour, which Edwards is calling "The Road to One America." "This is not about Appalachia, it is about all the poor regions of America: the black belt, the Rio Grande, the small towns of the Great Plains that are emptying out. He is trying to tap into the part of the base that is still sensitive to these social equality messages," Cross said. Edwards is not polling noticeably better among poor people than he is among Democrats at large, according to a recent Washington Post-ABC survey, which showed him at 10% support in Democratic and Democratic-leaning households with incomes below $20,000. Hillary Clinton drew 55% and Barack Obama 20%. Cross dismissed that result as meaningless: "You can't put any stock in national polling of poor people. Poor people have got a lot of other things to worry about other than an election more than a year away." For the rest of Greene's article, and some uninhibited comments from readers, click here. For a look at advance stories and editorials from the Appalachian stops on Edwards' tour, go to The Rural Blog for Saturday, July 14.